Artificial recharge plays a prominent role in the sustainable management of groundwater resources. The study has proposed a methodology to viable artificial recharge structure using geographical information system (GIS) and empirical equation techniques for augmenting groundwater resources in the Ranchi urban and rural area of Ranchi District, Jharkhand. The thematic layers for geomorphology, drainage density, order of streams, runoff and trend has been prepared in the GIS environment using convection and remote sensing data. It has been found that the slope and topographic gradient of Ranchi region is one of the major governing factors, which restricts to hold surface water stagnant. Jumar watershed is found as the most feasible watershed for the construction of check dams/percolation tanks followed by Lower Subarnarekha watershed. Out of 15 deeper exploratory wells, 14 are declining. Harmu watershed is found to be in the worst condition in terms of availability of runoff water. Harmu, Kanke, Bariyatu, Namkum, Doranda, Hinoo and Hatia have found as the most suitable locations for installation of RTRWH within the Ranchi urban area. Based on the available field information, check dams are suggested as the most promising artificial recharge structures for Ranchi rural environment. Artificial recharge plays a prominent role in the sustainable management of groundwater resources. 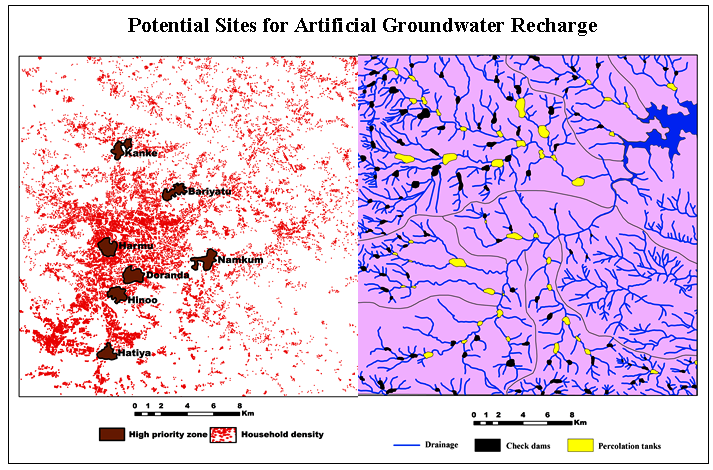 The study focuses on geospatial analysis to find suitable sites for artificial recharge using GIS and empirical equation techniques. The thematic layers for geomorphology, drainage density, order of streams, runoff and trend analysis have been used for selection of sites. The slope and topographic gradient of Ranchi region is one of the major governing factors restricts to hold surface water stagnant. Jumar watershed is found as the most feasible watershed for the construction of check dams/percolation.